Recipe contributed by D. Prewett. 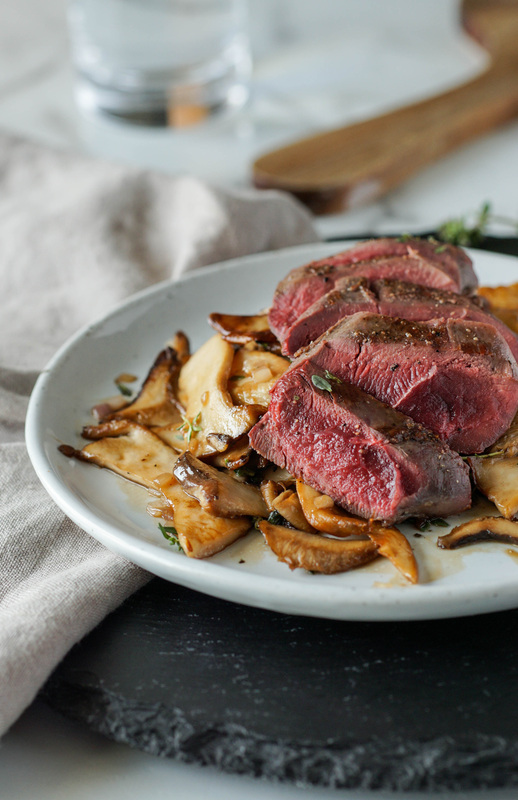 The classic combination of steak and mushrooms is a staple that every red meat lover savors, if you are one these people you are going to LOVE this recipe. Try a grain fed dabbling duck, like a Mallard or Pintail, seared on a hot pan, served rare on a bed of browned trumpet mushrooms with a pan sauce made with shallot, cognac, and thyme. If you don’t have duck, venison backstrap is a seamless substitute for this recipe and will be just as delicious! When picking out the mushrooms for this recipe, I just happened to stumble upon some giant trumpet mushrooms (also called king oyster) at my local grocery store. Unlike other mushrooms, the stems are not woody or chewy so you can cook the entire mushroom, not just the caps. They hold their firm, meaty texture well when cooked making them perfect for browning or even grilling. In rural North Dakota it’s quite rare to find ingredients like this. So, when it comes to deciding what to cook, I stick with my tried and true recipes. For me, there is something fantastic about the flavor combination of mushrooms, thyme and cognac. I don’t know why, but that is the “holy trinity” of some of my savory recipes. If you can’t find trumpet mushrooms don’t worry, portobellos and a variety of other mushrooms will also work. One of the most important things to remember when cooking with mushrooms is to clean them appropriately by gently brushing them with a slightly damp paper towel. They will never properly brown if they are still wet from rinsing them under water. If you hate washing dishes you’re in luck because this can be made all in one sauté pan, but it does require that you cook step by step. However, if you don’t mind extra dishes, you can use two separate pans to save time. One pan will be designated for cooking mushrooms, the second for the duck and sauce. The recipe below will give directions to cooking this all in one pan. Easy, rich and delicious. This is definitely one to bookmark for your next date night. 2 large Duck Breasts (I used Mallard) Substitute with Venison Backstrap or 1 Large Goose Breast, halved. Have the Duck prepped before cooking by patting them very dry with paper towels and seasoning generously with salt and pepper. Begin by browning the mushrooms in a large saute pan over medium high heat with a tablespoon of oil and a few sprigs of thyme. Cook the mushrooms for about 10 – 15 minutes until they are brown, being careful to only stir every couple of minutes. Remove the mushrooms once they are browned. Set them aside and keep warm. Turn up the heat to high and add a little more oil to the pan and sear the duck on both sides for 2-4 minutes. (If you use something larger such as goose or venison, it will take longer to cook). Remove the duck and let it rest under foil. Reduce the heat to medium low and add another tablespoon of oil or ghee to the pan. Add the shallots and saute until they begin to caramelize. Add the minced garlic and cook for an additional minute or until fragrant. Finally, add the Cognac to de-glaze the crispy bits in the pan and let the alcohol burn off. Add the stock and a few more sprigs of thyme and let the sauce gently simmer until reduced down to about half. This may take around 10 minutes. You can opt to finish the sauce by adding a small pat of butter or ghee. Season to taste with salt and pepper. After the sauce has reduced, you can serve it all at once together with the mushrooms and duck.